You heard it here first back in spring training. J T Realmuto has had it with the Feesh. After verbally spanking their terrific young catcher in March for asking to be traded in the wake of Beep Beep’s demolition derby, franchise hatchet man Mike Hill began purring and cooing late in the unlamented season about how Realmuto knew they loved him and how they were going to offer him an extension. “Reaching out,” is how he put it. Na-na-na-nope, the Golden Boy isn’t having it. For one thing, he surely seethes on about his public treatment by one of the least competent GMs in the game. For another, he’s now 27 and doubtless figures that in the 3-5 years, minimum, it takes this team to be respectable again, he’ll be banged up and have lost a step or two – meaning, after hanging on through one execrable season after another, they’ll unload him just as they’re ready to make some noise other than glup-glup-glup. There aren’t many teams who couldn’t use him, but there also aren’t many teams who would be able to re-sign him once his current two year controllability period ends. His agent, Jeff Berry, predicts he’ll be wearing a different uniform come the spring equinox. The possible fudge factor: whether the Feesh front orifice screws up trade talks and the team hangs onto their backstop to help ripen their larval pitching staph, thereby sharply reducing his trade value by squandering one of his two controllable years. Yes, they really are that stupid. Top hat and matching caveat: you may well ask – and should – whether this whole thing was a sideshow for the sake of whatever is left of the Macondo fan base. In this dystopia, even Beep Beep figured out that Realmuto wasn’t drawing any fans to his empty stadium by himself. The franchise had made him one of the three darkened figures in their rotogravure-like “Just Gettin’ Started” advertising images along with Lewis “The Bust” Brinson (he didn’t post a slash line so much as a “Z” that stood for Zorro) and Jose Urena, a decent young headhunter who’s about as likable as a funnel web spider. So, in order to keep from looking like a couple of soulless idiots – not much hope of that, of course – they have pretended to love J T with these blandishments of affection. All along, meanwhile, they never meant to keep him. I’m betting on the latter version. The Astros made a half-hearted pitch for JT last year. With the Sheriff packing his bags and leaving town, Maldonado a free agent who demonstrated a shocking inability to corral McCullers curve balls in a critical ALCS game, and Max Stassi exhibiting more of the skills one would expect of a backup catcher/DH, I expect they may be back in a more serious frame of mind. It’s hard to spot many other needs they have; but they need a solid catcher and they can afford to keep him if they pull the trigger. And I suspect even a pair of terminal bunglers like Beep Beep and Bloody Mike would prefer to see him go to the designatedhitterball league than to turn up in an NL East uniform and sink them repeatedly just as (they think) they’re becoming…er…contenders. The question is, who do the Astros have in their system that might be of interest to the Feesh? Bear in mind Beep Beep won’t be inclined to take on a fat salary in trade, so we’re mainly talking EYPs here and maybe one or two raggedy journeymen seething with VETERAN PRESENCE. The rumor from Spring 2018 was one-for-one Kyle Tucker – Houston’s number 2 prospect and OUTFIELDER OF THE FUTURE (TM). Given Kyle’s inauspicious attempts to crack the lineup in 2018, they might should have pulled the trigger (if the rumors are true). I will almost guarantee any offers from Houston figure heavily into their AAA lineup, which has a lot of kids backed up behind the MLB players. BTW, OG, just back from a sojourn in Paris. I can safely say I would rather be there than here. I finally got over the health concerns and dug into a duck confit with Aligot potatoes. Other than listening to sound of my arteries hardening as I ate it – it was fantastic. And if there is a more fun art museum in the world than the Orsay, I would love to know what it is. It’s hilarious that you say that. On Saturday morning in Santa Fe I’m giving a talk to the American Literature Association on the culinary writing of Jim Harrison and MFK Fischer, the theme of which is their iconographic representations of France as a food Mecca and the difficulty of establishing a true belletristic American food writing tradition. As far as Outfielders of the Future, does the name Lewis Brinson mean anything to you? The Feesh also have Victor Victor Victor Victor Mesa (or is it Victor Victor Victor Mesa?) and his brother Whatsisname Mesa, whom our front orifice didn’t seem to realize would be regarded by a big plurality of the Cuban community they were trying so hard to patronize as a couple of steenkin communistas. They have a couple of other kids they were patting themselves on the back for acquiring too, who came up for a cup of coffee last season and quickly went back to Nawlins or Jacksonville with their tails on fire. So I dunno. They’ve got more egg on their faces than a weasel in an eagle’s nest over their current crop of outfielders of the future. You mean Big Macs, Taco Bell and KFC won’t drive aesthetic writing about American food? OG, it’s Victor Victor and Victor Junior. Their father went to the George Foreman school of naming children. Oh, it’s Victor Victor. I thought it was Victor Victor. Thanks for the clarification. Incidentally, I’m spending the early hot stove season attending to hot stoves in Albuquerque before heading up I-25 to Santa Fe tomorrow. Last night I deviated maniacally from the Plant Paradox Diet to ingest America’s finest chicken fried steak at the Route 66 diner – my hands trembled as I picked up the fork, so good it is – and this morning I put away a plate of the nonpareil southwestern corned beef hash at Mannie’s across Central Avenue (Route 66) from the University of New Mexico campus. This afternoon, I’m gonna have a local specialty, the carne adovada burrito at Garcia’s Cafeteria in Old Town (carne adovada is a pork chile particular to this here part of the world, very earthy with a backtaste of sage and other native herbs). It’s Halloween. I don’t mind decaying corpses, skeletons, vampires or lycanthropes, but the children inside them are horrible. Last night I watched a quick interview with a few candidates for various orifices, including the truly nightmarish harridan Martha McSally, who is running for the US senate in Arizona. First the blessedly retired Jan Brewer, who you’d punch in the face if you weren’t afraid of getting your hand stuck in one of her wrinkles, and now this creature. 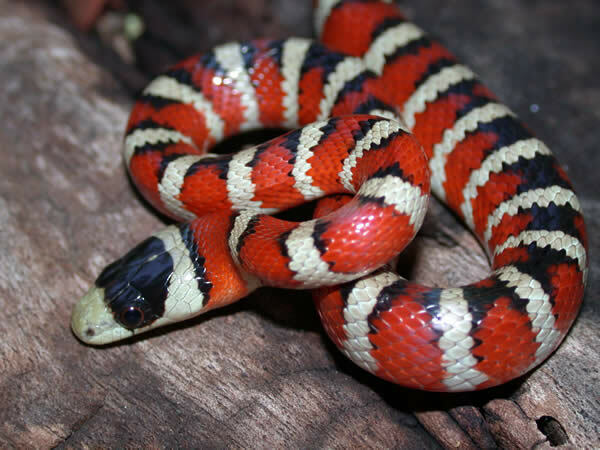 Why does Arizona, which produces such beautiful kingsnakes (see below; I’ll show you the snake but not frighten you with a photo of McSally), crank out such loathsome women? As if Pelosi, Waters and Wasserman Schultz are beauty queens. Not fond of any of them, especially Wasserman Schultz. But Jan Brewer was like their collective portrait of Dorian Gray. It would take all three of them to come up with anything nearly as hideous, and we’re not just talking surfaces here. McSally’s young enough – barely – that her ugliness is still mostly from the inside. I give her five years before it rises to her complexion. My extensive vacation experience of Arizona is that the landscape, the birds, the food and the amenities are marvelous. But the people are exceedingly weird and a touch dangerous. My favorite area is Navajo country. Or, to phrase it more succinctly: Great place to visit. I wouldn’t want to live there. Twins trade Miguel Sano for Realmuto!!!! There’s sort of a logic to it don’tcha think. If there’s any logic to it, you could count on the Feesh not to do it. How about this logic, since playing Sano at DH wouldn’t be an option he might strike out less. In The Bust, the Feesh already have their human windmill. When MLB next panics at its dwindling fan base and switches over to discreet offensive and defensive teams, we can talk about what else he can do. Folks in Braves Country want to poach JT away from the Feesh, but we have as much luck doing so as we do getting the Mets to trade us Jacob deGrom and Michael Conforto for a ham sandwich. Considering the gate at Macondo Banana Massacre Field and the voracity of the debt service on a ridiculous $1.3B price tag for this team, I wouldn’t be too surprised if Beep Beep cut bait on a trade within the division if it got him orf the hook for what JT is likely to win in arbitration this year. I suspect he would prefer otherwise, but it probably occurs to him that the turnout will be even lower next season – and no local cable channel or radio station will bite on an increase in royalties for carrying Feesh games, either.